Are you a woman ? Were you mesmerized by Kim Soo Hyun in "The Moon That Embraces The Sun" and enjoy listening to his attractive voice ? Well,there's a scientific reason why you are like that ! On February 23rd’s broadcast of MBC‘s “Feel Good Day,” a few of Kim Soo Hyun's fans said that one of his charm is his attractive voice. So the production crew went to the Sound Engineering Research Institute and consulted an expert, professor Bae Myung-jin. He caught my attention first in DH n he CAN sing alright!!!! His baby face is another incentive... If only he didn't remind me of my son, I wud probably drool over his every picture! Couldn't wait for his newest drama TMTETS. And I'm one of "the woman that embraces this drama" tightly . 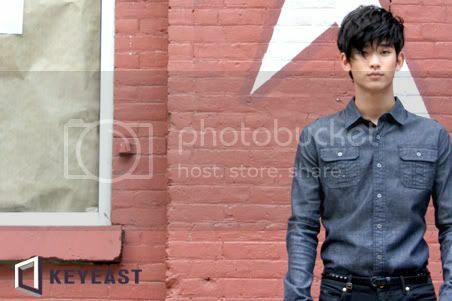 I'm excited to see the development of Kim Soo Hyun's acting [and singing] career! Momo, I look at every one of these young K-entertainers as my sons and daughters hehehe....and maybe grand children....hahaha..